The Oracular Opinion: Oh My Gosh! I’m 4 Years Old! Oh My Gosh! I’m 4 Years Old! September 17th…my four year blog anniversay—it came and went and I didn’t even realize it until today! Where’s my head? Please, don’t even answer that! My life is busy…crazy busy. Being a wife and a mom, working part-time and not having figured out how the heck to juggle ME time leaves my blog suffering. I know, at 46 I should know better. It’s just that with one son in Army Basic Training and the other just entering High School, my job still isn’t done; my ME time hasn’t really begun yet, so I fit in what ME time I can when I'm able. I’m sure there are moms out there who put themselves first, but I’m not one of those. My husband and kids are first; I’m last. That’s how I operate. So, until my youngest graduates or I figure out how to add more hours to my days, I’ll blog when I’m able…and you, my loyal readers, (you know who you are!) will have to accept me for who I am! 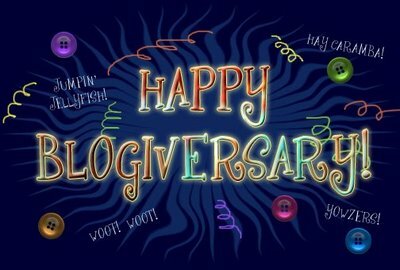 Happy Belated Blogiversary To Me! Let me be the first to offer congratulations. I think the sea creatures reached the same milestone last month. I haven't checked yet. I've been remiss. Wanna party? Octo: Thank you! I'd love to "party" and will be doing so shortly...my son graduates Oct 21st! I'm so excited! Pam - Time does fly, and with family and other obligations you are making the important AND correct choice. We'll all be around and checking in from time to time. And thanks again for material you have cross posted to RN USA. Its been awesome! Happy Anniversary! And many more years of blogging. Where's the par-TAY?! A hypocrite since day one. Congratulations. Pam, it's interesting that you got this Anonymous comment here just about the same time this morning that I got mine--and it was also nasty. The little coward posting as Anon is making his/her daily rounds, I guess, thinking we give a flying donut what he/she thinks. LOL! Shaw: Thank you! I wish you and I lived closer so that we could party! I’m disappointed that our plan for me to visit with you this year didn’t pan out. I had so much going on this year…but hopefully next Spring! I will be partying, though, in two weeks! My son will be graduating from Basic Training and we’ll be bringing him home! I’m SO excited…I can hardly wait! As far as Anon is concerned…it’s very sad that some people feel the need to leave not only untrue statements but cruel ones. I won’t waste my time dwelling on that…I have too much good in my life to be concerned with what someone wants to unjustly project onto me. You're doing a great job regardless! Happy anniversary! I don't know if I've commented here before, but I've read your comments on various liberal blogs. A few minutes ago, I read your comments on Octo's blog post about civility amongst people who have different political viewpoints. It's refreshing to hear a conservative seriously talk about civil discourse. I also read some of your posts here and was pleased to see that you practice what you preach. Keep up the good work! As you Know, I have a Slow Blog too. You seem to have a Pretty Big Following, though, even though you are Slow and I do Wonder how on Earth you do it. Sometime I Think that I become too Outspoken and Create Enemies. Oh Well. Happy Blogiverersary. Lista: Yes, it's been slow. But that's because I've been totally disgusted with politics lately so I haven't been posting about them. I've been posting on my other blog though. It's a lot more fun and I'm not limited in my topics.